Making a diary of your life is one special thing that you can cherish. It is the excellent way of storing and securing your personal or business information on a day-to-day basis. You can organize and secure the memories, ideas, business transactions, contact lists, emails, accounts, future plans and even secret information that only you have personal knowledge about and access to. 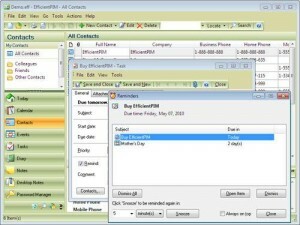 Through a diary software, you can keep all of these in one customizable, unique and secured environment. 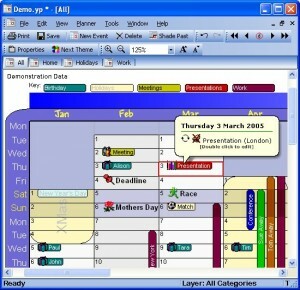 There are thousands of diary programs with specific designs and presentations to match your standards. To give you a clear picture of various diary programs that matches your needs, here are the top 10 diary software that you can use. Chrysanth NETime Diary best suits those who love writing and reading. It has a user-friendly and unique integrated interface intended for storing personal diary, photo albums, task manager, web blogging, PDF ebook creation and RSS, RDF, ATOM news feed reader. If you’re an author of books/ebooks, journalist, web blogger, or simply a subscriber of news feeds, this software will keep you updated. Efficient PIM Portable is fully-featured with an information manager that is suitable for your business and private life. You can keep track of your business appointments, contacts, events, and much more. Its single and easy-to-use interface can store things you need to manage. It has the key features of 8-interface styles for your personal choice, an integrated password manager to maintain privacy, with built-in editor for easy writing. It also has hierarchical subtasks, card view support, custom field for contacts, and various calendar views. If you want to have perfect and organized activities, this works best for you. Year Planner has simple multi-month pages that cover the entire 12 months. It has a classic layout planner for you to easily view and remember your appointments, plans for special events, and other schedules. This shows you a strategic view of activities ahead of time. It is MS Word-compatible for you to easily make your daily diary/journal with added event reminders that has definable sounds. You can customize the color schemes, fonts, and layouts that you want to use. You can even print a hard copy of your diary. 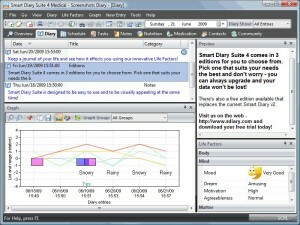 Smart Diary is both a diary software and full-featured personal information manager. It has unique Life Factors for you to remain organized and offers various approaches to your health, happiness, or lifestyle by simply plotting each on a single graph. It’s completely flexible and open for additional Life Factor packs. It also has a planner to keep always you on track of your daily appointments and to never miss a single event. If you want to take control of your timely activities, this software is what you need. If you want to have the ability to track your moods, organize daily posts and chart behaviors, My Therapy Journal is the best diary software for you. This best works for those who are stressed in planning daily activities. It can help you dig much deeper into your psyche through its written word. If you are dealing with problems such as finances, its chart will show you the progress on how you are dealing with the situation. You can even enter categories of Freestyle, Dreams, Poems, Life Lessons, and much more. If you’re looking for enlightenment and self-discovery, this is your type of diary. My Union Journal diary software is the clear definition of simplicity yet with major appeal. It is best suited for those Web bloggers, journalists, and readers of books/eBooks. It contains oversized buttons for you to easily navigate and place in tab-style pages to find specific dates or events that you want to view. The software can encrypt each post, photo, or document as soon as they are saved. It has a new entry, search, calendar, and profile page. It mainly focuses on giving you a minimalistic design for a pleasing and refreshing view. For a well-secured environment, where you can post your private thoughts and hide secretes, My eJournal is your destination. It’s a permanently private diary software. With its boastful pinkish homepage that has birds, flowers, and a pink feature design, it compels attraction, especially women. Being user-friendly, the pages are uncluttered, easy to navigate, direct, and you can use the journaling area with various options. This is best for those who don’t want any complication and people who wants to jump right away to their online diary system. 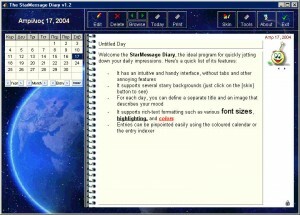 The StarMessage diary software provides a unique, panorama approach of putting your personal information. Its design is inspired with real personal diary, thus you can have that comfort zone of writing and showing your feelings and thoughts. You can use this as your personal planner and calendar with notes and reminders to keep you updated on your appointments. Its vibrant blue colored-background gives you the soothing effect that you need. 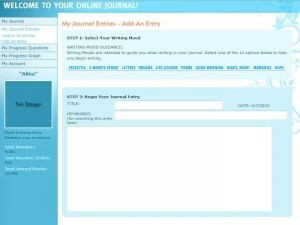 No wonder why many use Live Journal as their personal diary software. Within a breeze, you can use its aesthetic features. If you’re writing articles, stories, and diaries, you can easily master the program in no time through its user-friendly pages. With a clean layout, your eyes have a relaxing effect to keep you wanting more. Texts are uncluttered and your personal journal is fully-secured. With just a glimpse, your attention will surely stick on Penzu diary software. This top program protects your privacy and gives you the freedom to enjoy a unique and compelling experience in writing your personal diary. It’s perfect for making notes and entries with its rich, vibrant, and attractive designs. This best defines the purpose of secured and secrecy of personal information. You have the only key in opening your account. Each individual needs a feeling of privacy and security, right? When you’re having troubled-thoughts, sense of no direction, inspired, pressured, scared, happy, or feeling a mix of emotions and thoughts, a diary shows it all. Through these top 10 diary software, you only not enjoy organizing your life, you also have a better world where you alone can have personal access. If you want to stay in control and take the effort of improving your daily lifestyle, having your own personal diary via the help of technology is the way to stay on track. 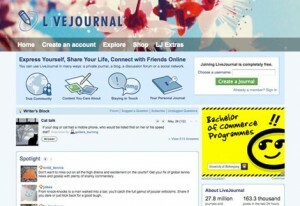 I just can’t wait to download Live Journal as I’m bursting to use its aesthetic features! Come on, some real reviews please!